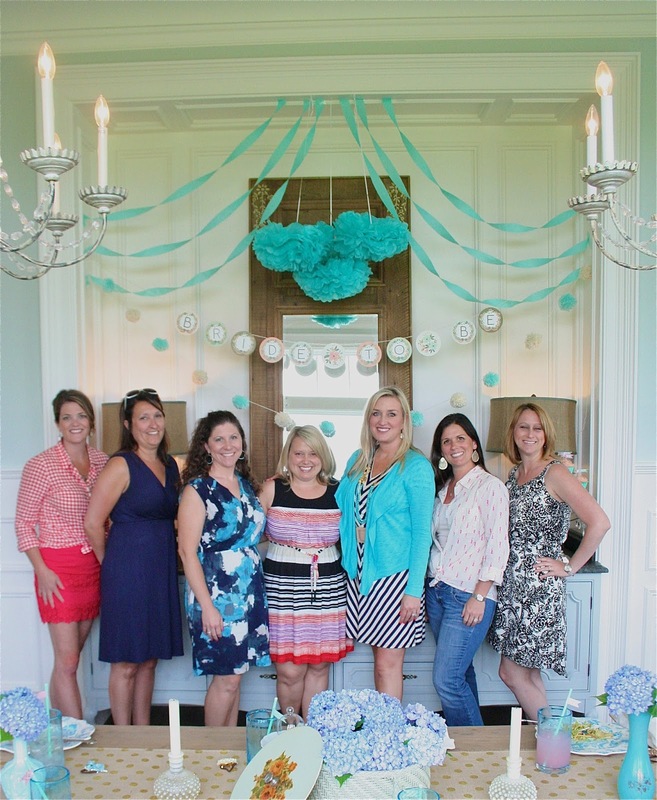 I recently hosted a bridal shower at my home for a dear friend that I have known for over twenty years. I am so excited for her because after years of searching, even moving to California, she found her prince charming right here in our hometown. The crazy part is that he went to high school with us. She has always had faith that she would find the right guy, and I admire that about her. Since she is such a special friend, and I love hosting this group of girls, I wanted to make sure the shower felt equally as special. I paid lots of attention to the details. First, I started with the color scheme. I love the Rifle Paper Company banner, which I made into a "Bride to Be" banner. The colors are pretty and chalky. 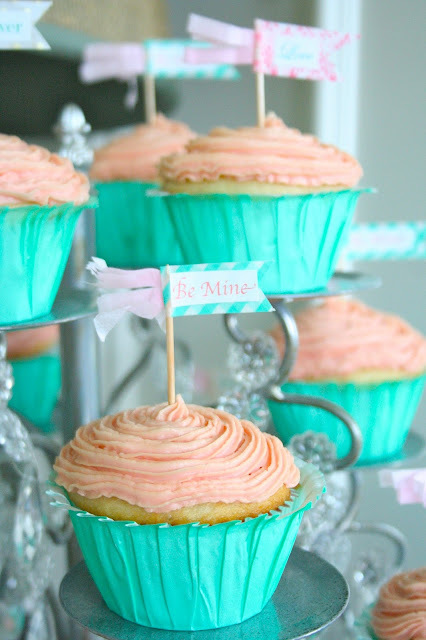 I especially love the coral and mint. I also wanted to incorporate some purple, since that is their wedding color. 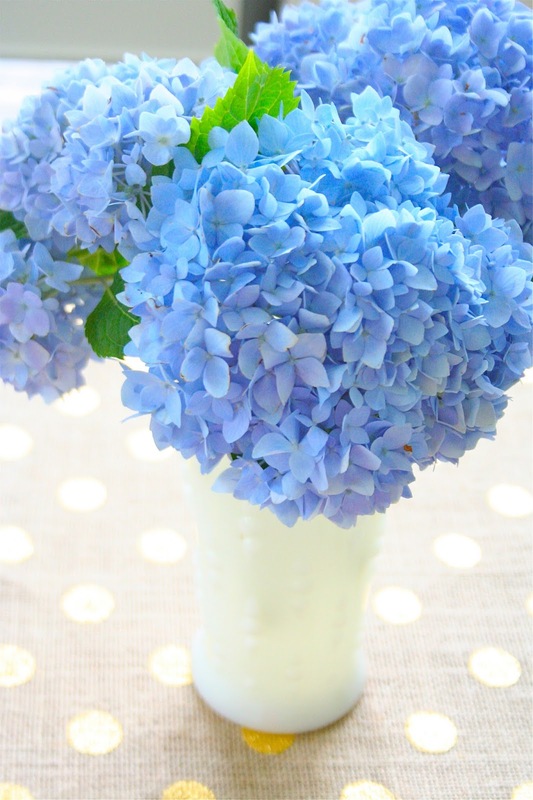 It worked out perfectly that my bluish purple hydrangeas are blooming right now. So I headed out to the garden and picked a bunch. 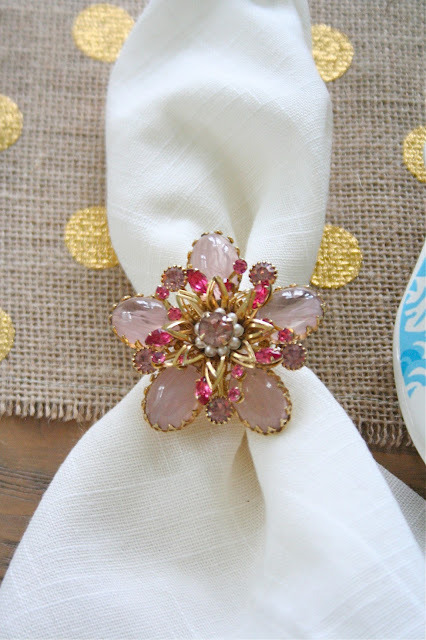 Lastly I chose a theme, and I'm calling it vintage, flea market inspired bridal shower. I will list the resources that I used as I go along. The banner was from the Rifle Paper Company. I found it locally at the Paper Source Store. 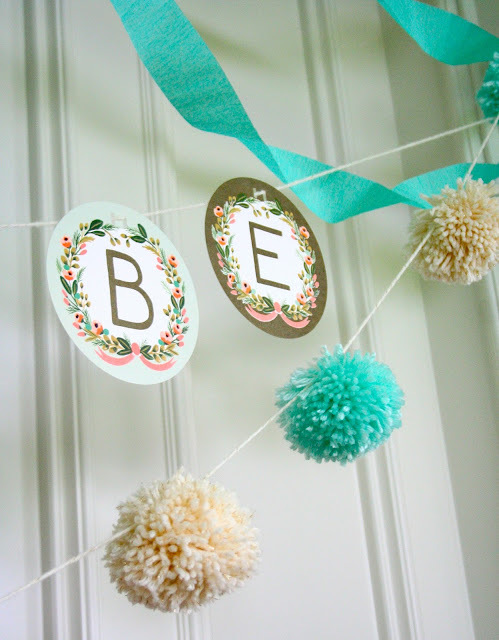 The pom pom garland I made myself. I used mint and cream yarn. This is a great project to get your kids involved with. 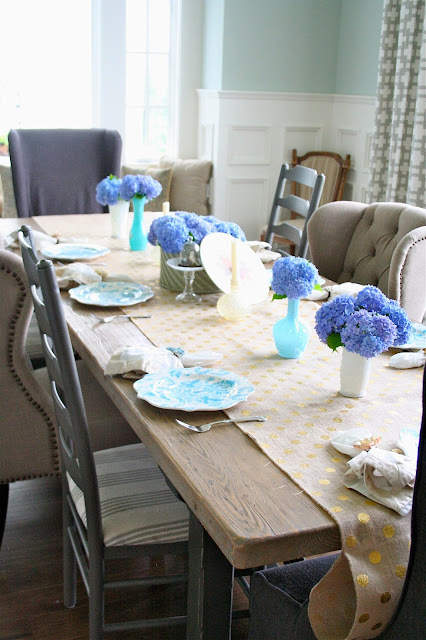 :) I set the buffet in my dining room as the food table, and I think it worked out perfectly. If you have been following me on my blog or instagram you know that I love to collect vintage white hobnail dishes. This is an occasion that they certainly come in handy. I used them for the food and some vases. I also used vintage tins that I had been collecting for vases, and an Anthropologie vase. 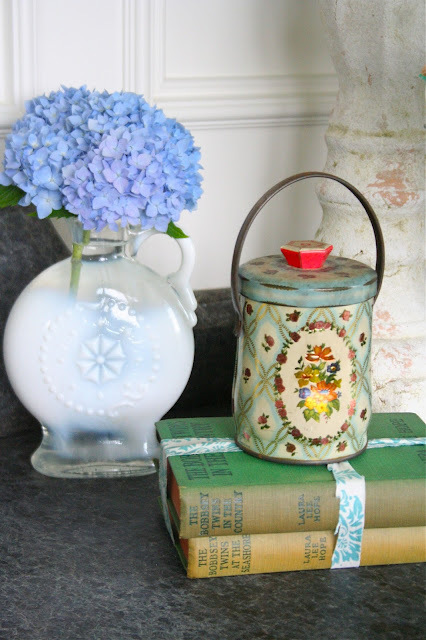 Vintage items I used. I stacked the books and bounded them with material scraps. I made the cake toppers out of washi tape, and some tissue paper. I then printed out cute little words to put on them. I used be mine, love, and forever. 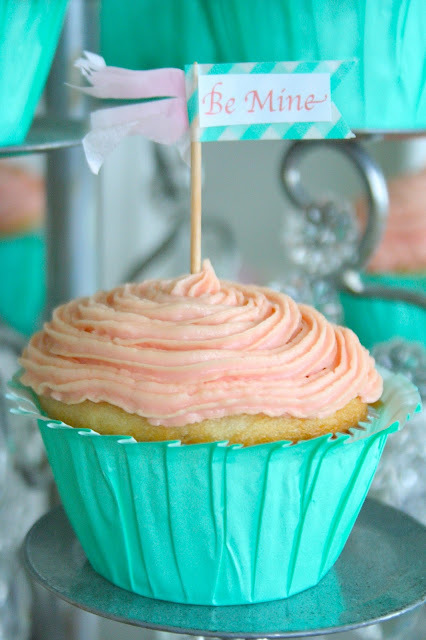 I also made the cupcakes, and custom matched the icing to the Rifle Paper Company banner. I made a personalized frame for the couple. 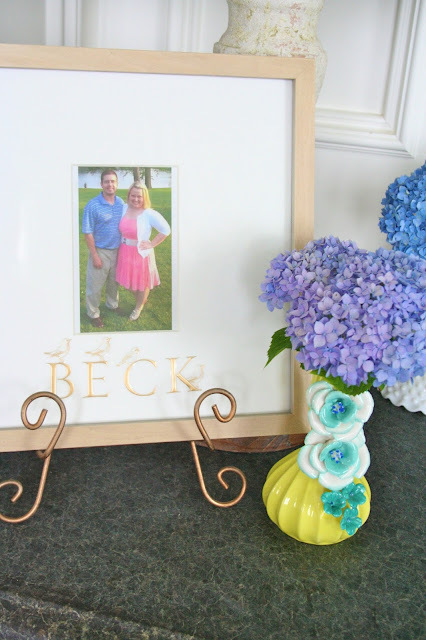 I was super easy, I found the frame at Target, and then used Martha Stewart stickers to personalize it. I served chicken salad with walnuts and grapes, along with oriental coleslaw, black pepper potato chips, and fruit. Simple and easy, but perfect for a bridal shower luncheon. I found this fun burlap and gold polka dot fabric at Joann Fabrics. 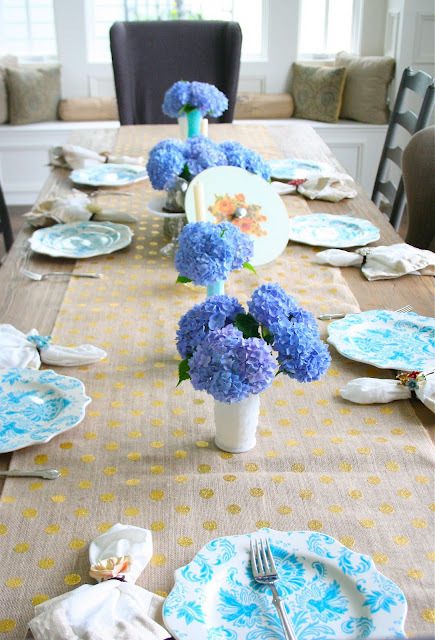 When I saw it, I instantly thought it would make a perfect table runner. I ended up sewing up the sides to keep it from fraying, and ran a lint brush over it, because it will shed. 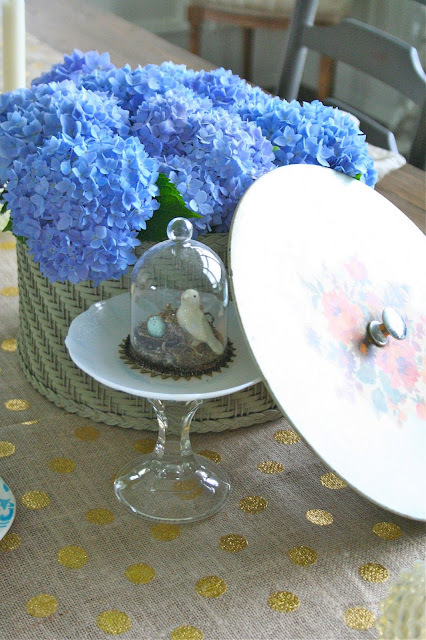 A vintage sewing box worked out perfectly to put the hydrangeas in. 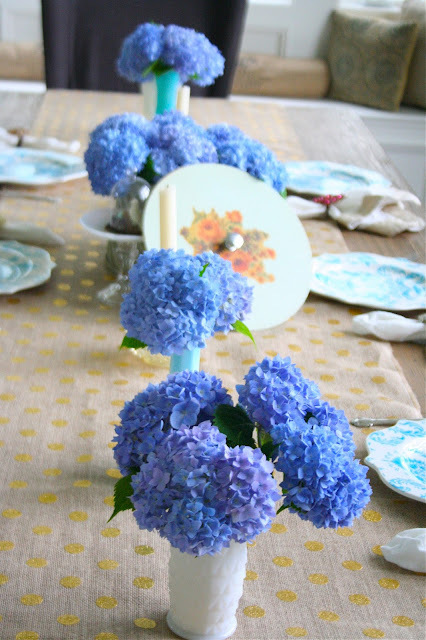 I just filled small glasses with water, and then put the hydrangeas in the glasses. 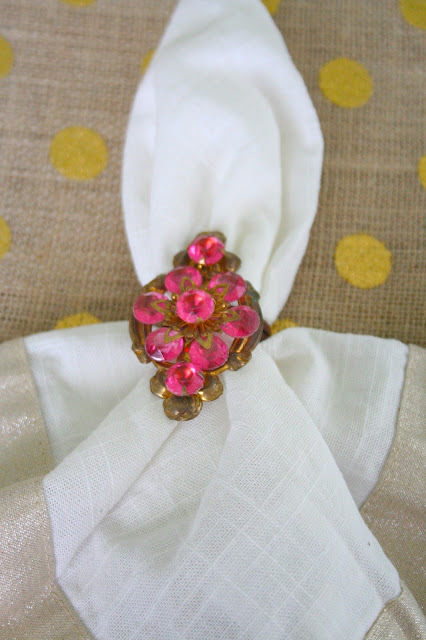 Since I have a collection of vintage brooches, because I make jewelry using them at Lulubelles.com, I used them as napkin rings. Each one was unique, just like each of the girls. I had a drink station set up on a small buffet piece. 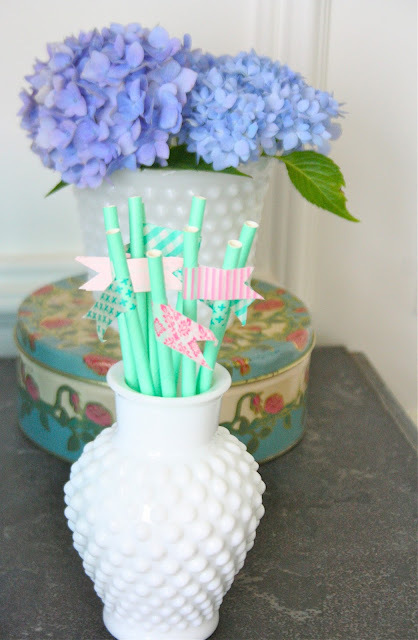 Washi tape and paper straws is always a cute combo. I love all these girls so much. We have been through a lot together. Friendships should be treasured, and I certainly treasure these ladies. 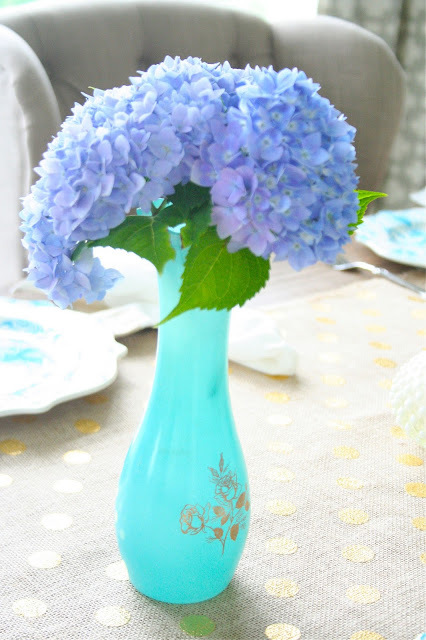 Oh I just love the bridal shower decorations, colors, and flowers! I decided to throw one of my girlfriends a kid's birthday party themed bridal shower. I am making a pinata, pin the tail on the bride game, and love bingo! I know we are just a bunch of big kids but she'll love it! Now I have some more wonderful color schemes to consider. 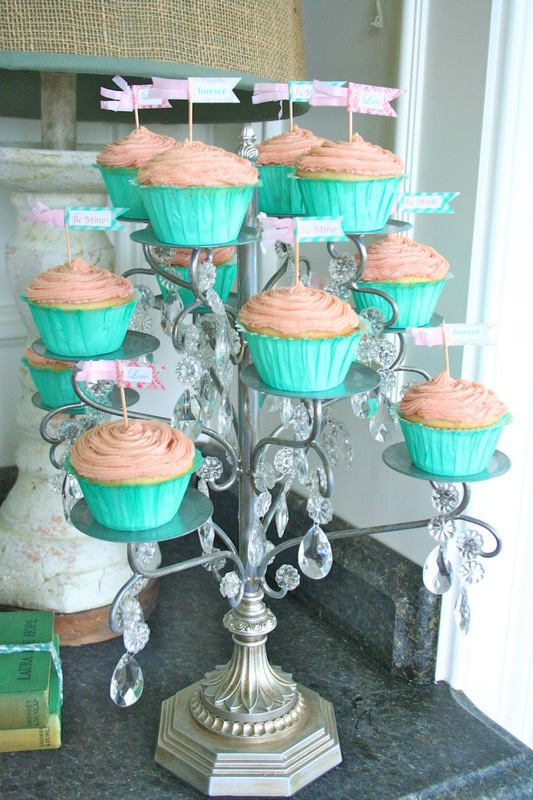 Now we just have to get the Bridal Shower Invitations that portray the theme. 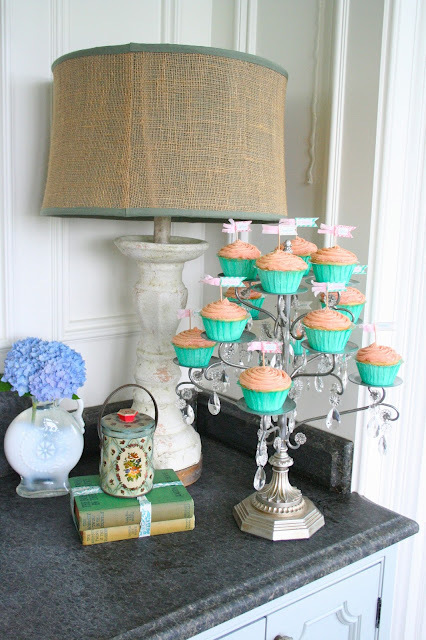 I love the bridal shower decorations, so sweet!